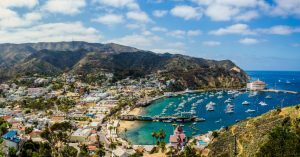 When planning a trip to California with the kids, a Catalina Island eco-tour is something the whole family is sure to enjoy. Located a few miles off the coast of Southern California, Catalina has a wonderfully diverse ecosystem that is breathtaking to behold. Consider the weather when packing clothes and gear for your trip. Since this is an island eco-tour, comfy summer clothing is a must. Make sure you bring along towels to mop up sweat and caps and sunglasses to protect yourselves from the sun. Temperatures on Catalina Island can be chilly at night, however, so make sure you pack long pants and a coat. Catalina Island has many campgrounds dotting the island for those who want to experience the rugged beauty of nature. Amenities and accessibility to town differ per campground so make sure you already have everything you need. Fire starters, garbage bags, water and more are essential to being comfortable on a camping trip. Transport services are also available on the island to haul your camping gear to your desired campground. This way, you don't have to lug all that equipment with you while you tour the island. Hiking and sightseeing could be tiring for your children, so make sure you bring along enough food to keep their energy up. You would also need to bring plenty of water. Dehydration is a risk when touring the island so make sure you watch out for signs of dehydration in your children. Make sure you also stock up on sunscreen, bug spray, and toilet paper. Though Catalina has many commercial establishments to accommodate the tourists that visit the island, it wouldn't hurt to bring your own supplies. Due to how Catalina is separated from the mainland, food and other supplies may be more expensive than what you're used to. If you're looking for a slice of paradise near California, Catalina is the place to be. Without the hustle and bustle of the city, you and your family will be able to reconnect not only with nature but with one another as well.